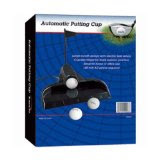 Golf Training Aids make great gift ideas, a perfect way to practice the golf game while away from the course. Gift ideas might include hitting mats, instructional DVDs, and swing trainers. Also, shown in the picture below is the INTECH Electric Putting Cup Return which lets golfers practice their putting game indoors all year long! !